There are approximately 500,000 low-back fusion procedures performed annually in the United States. However, spinal fusion does not always relieve pain as intended. In fact, residual pain after successful spinal fusion occurs after as many as 40% of spinal surgeries and severely reduces the quality of life for patients. Furthermore, patients are often prescribed opioids to combat residual pain, which has contributed to the current opioid epidemic. 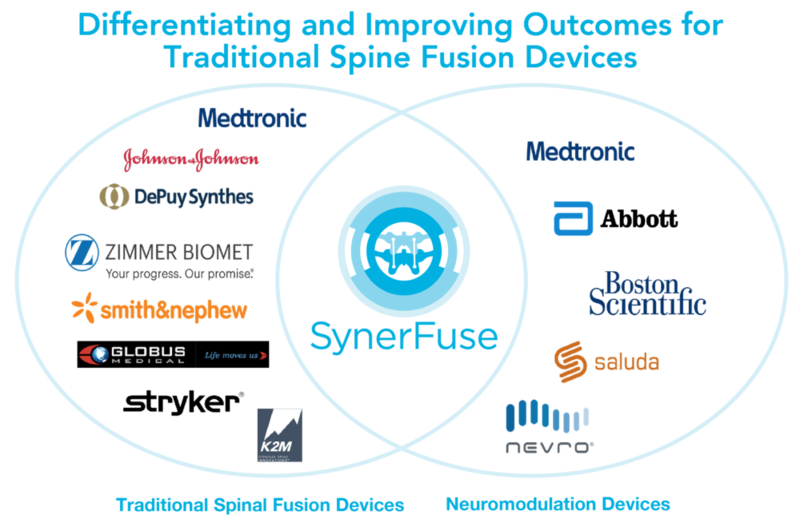 SynerFuse believes that patients deserve a better option and is working to address the problem of chronic low-back pain by developing a device that addresses three types of pain: mechanical/nociceptive pain caused by poor alignment; neuropathic pain caused by damage of the nerve trunk and oversensitization of nerves in the brain and spinal cord; and post-surgical pain, which is inherently caused by the surgical procedure. SynerFuse believes that addressing all three types of pain simultaneously will lead to better patient outcomes and reduced cost of care.